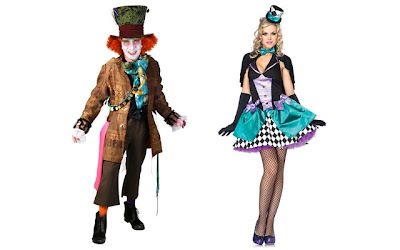 When looking for a costume that is fun, bold, and a little outrageous, what better role models to turn to than the characters of the very artfully outrageous film Disney's Alice in Wonderland? Johnny Depp, who starred as the Mad Hatter, in the live action remake of this film, has made the character into a pop culture icon of the 21st century. There is no doubt that Mad Hatter costumes will be very sought after this Halloween and for other costumed events throughout the year. If you ladies think you are out of luck, you could not be more wrong. The character of the Mad Hatter has translated very well into costumes for women. One of my favorites is this Showgirl Mad Hatter costume, which is fabulous enough to have walked right off the runway. Add your own colorful little drawstring backpack or wristlet and you will be ready for Halloween party hopping. This costume includes the dress, the little top hat, and the cape with the matching bow tie. I love the way the model has added the long gloves and fishnet stockings. Throw in a pair of purple, teal, or black heels, and you will have the perfect costume to get you noticed on Halloween. To find out more about this or other Alice in Wonderland costumes, visit BuyAliceInWonderlandCostumes.com.